Liveright Publishing Corporation, 9780871406729, 368pp. 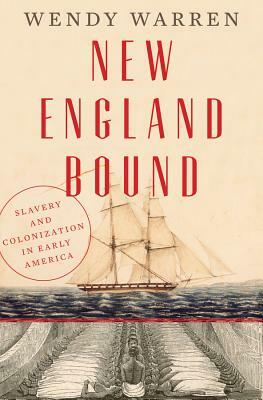 In a work that fundamentally recasts the history of colonial America, Wendy Warren shows how the institution of slavery was inexorably linked with the first century of English colonization of New England. While most histories of slavery in early America confine themselves to the Southern colonies and the Caribbean, New England Bound forcefully widens the historical aperture to include the entirety of English North America, integrating the famed "city on a hill" of seventeenth-century Puritan New England into the cruel Atlantic system from its very beginnings. Using original research culled from dozens of archives, Warren conclusively links the growth of the northern colonies to the Atlantic slave trade, showing how seventeenth-century New England's fledgling economy derived its vitality from the profusion of ships that coursed through its ports, passing through on their way to and from the West Indian sugar colonies. What's more, leading New England families like the Winthrops and Pynchons invested heavily in the West Indies, owning both land and human property, the profits of which eventually wended their way back north. That money, New England Bound shows, was the tragic fuel for the colonial wars of removal and replacement of New England Indians that characterized the initial colonization of the region. Warren painstakingly documents the little-known history of how Native Americans were systematically sold as slaves to plantations in the Caribbean, even in the first decades of English colonization. And even while New England Bound explains the way in which the Atlantic slave trade drove the colonization of New England, it also brings to light, in many cases for the first time ever, the lives of the thousands of reluctant Indian and African slaves who found themselves forced into the project of building that city on a hill. We encounter enslaved Africans working side jobs as con artists, enslaved Indians who protested their banishment to sugar islands, enslaved Africans who set fire to their owners' homes and goods, and enslaved Africans who saved their owners' lives. In Warren's meticulous, compelling, and hard-won recovery of such forgotten lives, the true variety of chattel slavery in the Americas comes to light, and New England Bound becomes the new standard for understanding colonial America.